UK gay rights organization Stonewall has launched a nationwide campaign aimed at galvanizing LGBTQ allies in the fight against hate crimes and discrimination, as new research exposes shocking levels of abuse directed toward sexual and gender minorities in Britain. “Come Out For LGBT,” the London-based charity’s first major campaign in a decade, is calling on passive supporters of LGBTQ rights to get involved in a range of activities designed to tackle mounting intolerance. “Believing in equal LGBT rights is great, but we want to see people take this to the next level, whether that’s something big or small. It could mean attending a pride event and cheering, or sharing a social media post, or even just calling out homophobic language like ‘that’s so gay’ when you hear it at school or work," Stonewall’s senior communications officer, Matt Horwood, told NBC News. “Come Out For LGBT" is reaching the public through an online campaign video and images displayed on buses, billboards and other public spaces, with publicity companies providing free media space. The charity also created campaign materials that can used in faith communities, workplaces and schools. “Those groups can use the message of the campaign to help impact positive work for LGBT equality in their communities,” Horwood said. Meanwhile, Arsenal and Manchester United are among several leading English Premier League soccer teams lending their support to the campaign in a further bid to stamp out the homophobic abuse still rife in the British game. “LGBT fans want to know that their favorite players and clubs support them back and do not agree with homophobia, biphobia or transphobia,” Horwood said. “Come Out For LGBT” coincides with the release of a Stonewall report revealing hate crimes against LGBTQ people have shot up by almost 80 percent across England, Scotland and Wales since 2013. The findings, based on a YouGov survey of more than 5,000 LGBTQ people in Britain, found 16 percent of lesbian, gay and bisexual people have experienced a hate crime or incident in the last 12 months, up from 9 percent four years ago. More than 40 percent of trans people have been targeted because of their gender identity in the past year, the report showed. Victims recounted cases of intimidation, harassment, physical assault and unwanted sexual contact, with those from ethnic minority backgrounds, young people, disabled people and those belonging to non-Christian faiths disproportionately affected. Abebi, 34, from Scotland, told researchers she had been attacked by two women as she tried to use the bathroom in a bar. “They began pushing me and shouted that I was in the wrong bathroom and pointed out that this was the ladies’ bathroom. I told them that I knew which bathroom it was and I was in the right place, but they persisted. Since then I avoid public toilets wherever possible,” she said. Four in five LGBTQ victims who experienced a hate crime or incident chose not to report it to police, according to the findings. Stonewall, while acknowledging the huge strides Britain has taken in recent years to protect LGBTQ rights, called the report's findings “stark,” with many respondents admitting to being fearful of walking down certain streets or holding their partner's hand. “While we’re aware and appalled at the fact that anti-LGBT hate crimes remain an enormous problem for LGBT people in Britain, the extent to which our latest report proves this did come as a shock,” Horwood said. 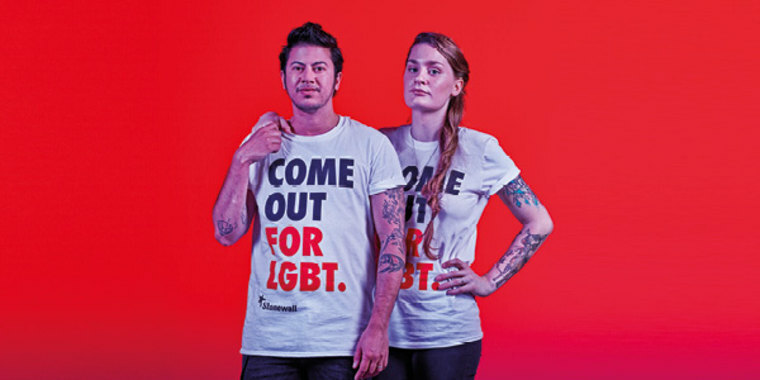 “Come Out For LGBT”, backed by celebrities, sports stars and members of Britain’s armed forces, is an extension of Stonewall’s iconic “Get Over It!” campaign launched in 2007 to tackle homophobic, biphobic and transphobic bullying in the classroom. The charity took its name from the famous riots in 1969 at the Stonewall Inn in New York City, which have largely been credited with igniting the modern global LGBTQ rights movement.